Popppappp is a novel about the visual and the political. Two British graphic designers find themselves imprisoned in a brutalist Syrian media centre by the Kamerads, a fanatical paramilitary organisation intent on making a fundamentalist religion from the lyrics of Sark E. Myth, lead singer in post-punk band the Foul. Popppappp and the Cowardly Minotaur believe they can stay alive as long as their design skills enhance the Sark-e-hideen’s broadcasts and magazines. All around them hostages are being executed and cultural monuments destroyed, but the two designers sit in Arne Jacobsen Ant chairs discussing the design history of watches, cars and typefaces. Soon, however, their lives will take a turn for the worse. Momus is the artist name of Nick Currie. Born in Scotland in 1960, Currie studied literature at Aberdeen University before launching himself as a singer-songwriter specialized in electronic folk music. In the 21st century he has developed parallel careers as a performance artist and author. His work of fiction includes Book of Jokes, Solution 11-167: Book of Scotlands, Solution 214 – 238: Book of Japans, and UnAmerica. 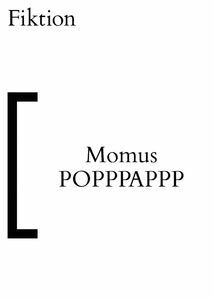 Popppappp is, following Herr F, the second novel Momus has published with Fiktion.